I have been deeply influenced by the plumbing work of Thomas Crapper & Co. as well as the visual style of pulp magazine covers. Yes, he really existed. Yes, that's where the word comes from. Yes the have a website. During World War II American GI's saw the name "Crapper" all over England and brought the word back to America. Thomas Crapper (baptized 28 September 1836; died 27 January 1910) was a plumber who founded Thomas Crapper & Co. in London. Contrary to widespread misconceptions, Crapper did not invent the flush toilet. He did, however, do much to increase the popularity of the toilet, and developed some important related inventions, such as the ballcock. He was noted for the quality of his products and received several Royal Warrants. The manhole covers with Crapper's company's name on them in Westminster Abbey are now a minor tourist attraction. It has often been claimed in popular culture that the slang term for human bodily waste, "crap", originated with Thomas Crapper because of his association with lavatories. The most common version of this story is that American servicemen stationed in England during World War I saw his name on cisterns and used it as army slang, i.e., "I'm going to the crapper". The word crap is actually of Middle English origin; and hence predates its application to bodily waste. Its first application to bodily waste, according to the Oxford English Dictionary, appeared in 1846 under a reference to a crapping ken, or a privy, where ken means a house. Pulp magazines (often referred to as "the pulps"), also collectively known as pulp fiction, refers to inexpensive fiction magazines published from 1896 through the 1950s. The typical pulp magazine was seven inches wide by ten inches high, half an inch thick, and 128 pages long. Pulps were printed on cheap paper with ragged, untrimmed edges. The name pulp comes from the cheap wood pulp paper on which the magazines were printed. Magazines printed on better paper were called "glossies" or "slicks." In their first decades, they were most often priced at ten cents per magazine, while competing slicks were 25 cents apiece. 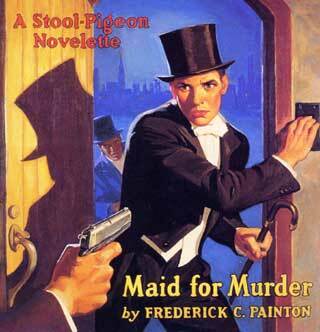 Pulps were the successor to the penny dreadfuls, dime novels, and short fiction magazines of the 19th century. Although many respected writers wrote for pulps, the magazines are best remembered for their lurid and exploitative stories and sensational cover art. Modern superhero comic books are sometimes considered descendants of "hero pulps"; pulp magazines often featured illustrated novel-length stories of heroic characters, such as The Shadow, Doc Savage, and The Phantom Detective. George Rozen, Detective Fiction Weekly, 4/1938. H.J. Ward: "The Whisperers," Spicy Mystery, 4/1942.